Poetry Machine is a text generator based on semantic networks. Users can enter concepts that are meaningful to them or for which they expect an answer. Poetry Machine responds with a never ending stream of sentences that circulate around these words. Since these answers are not dependent on scripted answering modules that were written beforehand but are generated dynamically, they are always different and never repeat themselves. They are printed out on a projection screen and spoken out loudly by a text-to-speech system. 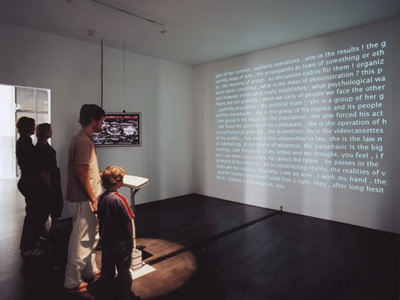 The semantic information of Poetry Machine comes mainly from the internet. Autonomous "bots" continuously search the internet for concepts that are still unknown to the program and feed the resulting documents back into its database. Consequently, the content of the database and the output of the machine change over time. 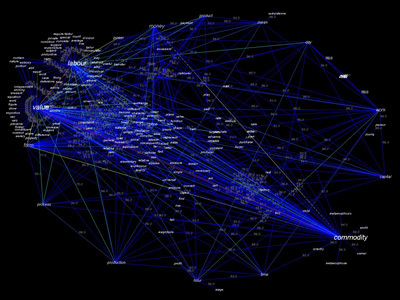 Poetry Machine consists out of the central program that reads and writes texts, a bot system that automatically retrieves information from the internet, a chat client that communicates with people in chatrooms and a local display that shows the current network structures in the database.